Want to the know the true Identity of your applicant…? Is it mandatory under federal or state law to fingerprint your applicants…? Are you attempting to gain a Security access or to work at a School, or “Are you a Volunteer” at your Church, needing to be fingerprinted….? Are you simply a Parent helping to support an after School activity, Club, or an after school Club Sport….? With all these circumstances, Fingerprinting is one solution to consider to validate identity, meet statutory guidelines (if mandated by law), and for confirming one’s nationwide criminal history record through the FBI record-keeping systems. More importantly, Does a Criminal Conviction Record exist for the Applicant, for the Volunteer, or for the Worker, that you must make a decision about…..? Conducting an FBI Fingerprint check is considered to be the most definitive background check tool available to you, as a private sector Employer, School, Church or other organization. FBI Criminal History Checks for Employment (and Licensing) is codified for non-criminal justice purposes in Public Law (Pub. L.) 92-544. Pursuant to this law, the FBI is empowered to exchange criminal history record information with officials of state and local governments for employment, or licensing, which includes volunteers, and other similar non-criminal justice purposes, if authorized by and under a given state statute. 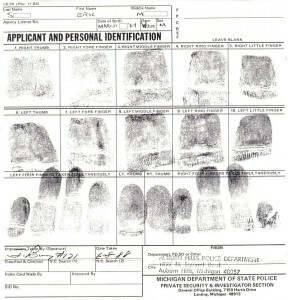 Consequently, the Department of Justice has advised that “the state statute establishing guidelines for a category of employment, or the issuance of a license must, in itself, require fingerprinting and authorize the governmental licensing or employing agency, to exchange fingerprint data directly with the FBI”. Therefore, legal certainty exists to employ and utilize this vital screening task. In the circumstance adverse criminal history information is found, then many employers choose to validate that information, at the source jurisdiction. Our firm solves this problem by doing the court file research in the field, proving the authenticity of the original record, and documenting that record for your hiring decision, licensing matter, or to mitigate concerns of participating volunteers. Your file is now complete. Electronic fingerprinting service, or rolled prints, is available through FBI approved vendors and law enforcement agencies. Depending on the area of the country this service is needed, or may be needed by your organization, then your physical location will dictate Whom the available resource partner will be to handle your fingerprinting requirements. Contact our office with any question or to get started today.